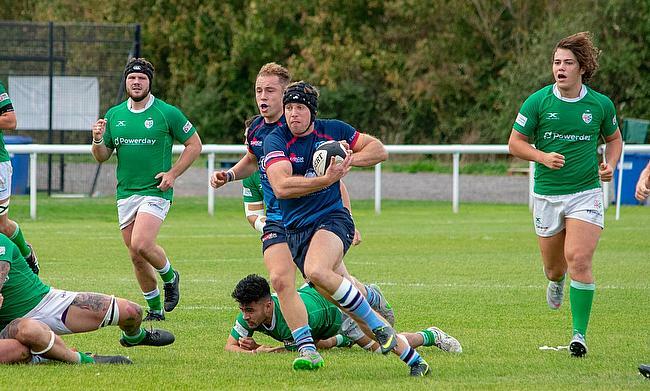 Joe Duffelen insists Rams RFC must not get complacent if they are to keep their promotion challenge on track in National Two South. Last Saturday’s victory over Redruth saw the Rams extend their winning run to nine matches as the league leaders further cemented their position at the top of the division. The win in Cornwall leaves Seb Reynolds’ side nine points clear at the summit with three matches to play before the Christmas break. They take on Clifton in Round 14 before facing Birmingham & Solihull and London Irish Wild Geese in their final two fixtures of the year. Duffelen, who has scored six tries this term, is eager for his side to maintain their concentration as they look to stay in control of the title race. Redruth 14 vs. 32 Rams – 1 December 2018. “So far so good!” Duffelen said. “We’ve taken every game as it comes. Every week poses a new challenge because there are a lot of good teams in this league and every week we are preparing for something different. Duffelen has certainly played his part in Rams RFC’s recent rise in National Two South. Since their promotion to this level in 2015, the Berkshire club have not finished outside the top seven and now they are mounting a serious challenge for place in National One. “It’s been nice to build on last year’s third place,” he said. “I don’t think there was an expectation to finish as high as we did. Duffelen also attributed Rams RFC’s development to the coaches as well as the culture at the club. “The coaching staff have been fantastic,” added Duffelen, who has been with the club for over a decade. “Things have changed in the past couple of years by introducing S&C coaches, a new defensive coach and we have obviously got Seb who has been fantastic as head coach. “They’ve created an identity and culture within the club. When you’re in positive working environment, you are more likely to perform. It’s all about expressing ourselves and enjoying our rugby. This weekend, Rams RFC face Clifton as they aim to extend their winning run to 10 matches. Their excellent form has created some breathing space at the top of the division, but Duffelen is keen for his side to keep their feet on the ground. “Clifton is a completely new challenge again,” Duffelen said. “They have just come off the back of a massive win against Barnes and they also beat Bury and both are great teams so we are massively expecting a challenge from Clifton. “If we focus on the task in hand, we can come away with another win and keep that momentum. We are aware of the competition below us for promotion and I think that actually makes it more of a challenge because there are so many teams like Canterbury, Henley [Hawks] and Taunton [Titans] that are still fighting for the top spots. In terms of the title race, the Rams are very much in the driving seat and Duffelen also admitted that promotion is a realistic goal, but was quick to point out that his side are not looking too far ahead. He added: “We have got a chance. There are number of teams that have a chance [of promotion]. “We really have to stay focused. Would we like to get promoted? The answer would be yes and I suspect that would be the same for quite a few teams.